The Baby Jogger City Mini is an enticing stroller option that is easy to push and turn and impressed during much of our testing process. This stroller is relatively lightweight, compact when folded and has some nice features like a handbrake and adjustable handlebar. Unfortunately, it also has a significant safety concern that causes it to tip backward when baby moves up the seat back in the fully reclined position. Because of this continued problem with the GT we feel parents are better off considering the less expensive Baby Jogger City Mini or a non-Baby Jogger option as their full-size primary stroller. The Baby Jogger City Mini GT is a high ranking stroller, but the back tipping potential raises safety concerns for us making it a stroller we don't recommend despite the higher score. The Baby Jogger company began in 1984 by parents who desired the opportunity to go out and about jogging with their babies. To solve this little problem, they designed the very first stroller meant specifically for jogging. Since the beginning, Baby Jogger has designed several kinds of strollers for lots of activities. In 2015, Baby Jogger was purchased by Newell Rubbermaid, and together they have continued to create strollers popular with many parents. The comparison chart includes the overall scores for all the full-size strollers we tested including the Baby Jogger City Mini GT (in blue). The sections below include information on how the City Mini GT performed during testing relative to its competitors. One of the most popular features of the Baby Jogger strollers is the quick pull fold, as seen here on the seat of the City Mini GT. The GT earned just a 5 of 10 for ease of use in our testing, which is unimpressive as it falls below average for the group. The City Mini GT has an auto-lock that works well and keeps the stroller closed for easier transport and storing. The GT has a one-handed fold, auto-locks, and comes with a carry strap. It doesn't have a self-standing capability, which makes it tougher to manage once folded. The fold is an easy process with three steps if you don't count unsnapping the safety straps that prevent accidental folding. We suspect that many people won't use the straps, which is a safety concern. It takes two steps to unfold, in addition to the strap attachment (which you should do). The GT is one of the few non-jogging options with a handbrake. This handbrake works well and has a feature that prevents accidental brake releasing. The brakes on the City Mini are single action brakes operated via a handbrake located on the handlebar. They are easy to set, release, and are sandal foot friendly. This handbrake has a locking switch to keep it from releasing by accident. The storage on the Baby Jogger City Mini GT is large, but the lower seat and a cross bar make it difficult to access and limit what can be put inside. The storage basket on the GT is large and holds up to 20 lbs, but we could only fit our medium diaper bag inside because of poor accessibility. The lower seat design and frame bar that goes across the back makes it a tight fit. This seat has a seat back pocket that is large and good for convenience items such as car keys or a cell phone. The pouch is easy to use, but cannot conceal items and is not weatherproof. The canopy on the City Mini GT has two peek-a-boo windows that make spying on baby easy. We wish they had magnetic closure instead of hook and loop, but it is still a better canopy than much of the competition. The GT has a large sunshade with a UV rating of 50+. The canopy has two medium sized peek-a-boo windows made of vinyl that make viewing baby extremely easy. The window covers close with hook and loop closures and would be nicer if they were the silent magnet type. There is no ventilation on this canopy or the seat back. The harness on the City Mini GT is not the easiest one to use with a weird knob on the back of the buckle that prevents releasing the buckle if pressed. The 5-point harness on the GT is relatively easy to get on, and a little harder to take off with hard to adjustable shoulder height straps. The buckle snaps together easily, but it has a knob on the back that prevents release when you press it at the same time as the front button. The Baby Jogger City Mini GT has a one-handed recline pull that works well but is a little stiff and harder to raise. The leg rest on this stroller is padded and feels comfortable, but is not adjustable. It has a full footrest covered in a durable fabric that wipes clean. The GT has a one-handed recline with adjustable straps on either side that are held together with a pull. The process isn't as easy as it should be and raising the seat requires two hands. The GT is compatible with several different brand infant car seats, including the Chicco as seen here with the Keyfit 30. The City Mini GT is not compatible with any infant car seat without the purchase of accessory adapters. You can buy adapter frames for models of the Britax/BOB, Peg Perego, Chicco, Cybex, Maxi Cosi, Nuna Pipa, Graco, and UPPAbaby infant car seats. These adapters will work with the award-winning Peg Perego Primo Viaggio 4-35, Chicco KeyFit 30 and the UPPAbaby Mesa. To use the adapter parents will need to assemble the frame and remove the canopy on the stroller. The infant seat attaches using a click-in and strap method that we think is more complicated and could potentially lead to mistakes. We imagine many parents will feel the click is sufficient and might skip the strap part, this could result in a potential safety issue, which is why we prefer the click only installation method. This Baby Jogger earned an 8 of 10 for setup, tying with the regular City Mini and 4 points higher than the Baby Jogger City Select. It took us about 6 and 1/2 minutes to put this stroller together. The documentation for this stroller is average, and the instructions would be easier to follow if the three languages were in different sections instead of occurring on the same page. There are no tools required to assemble this stroller. The City Mini GT is marketed as an "all-terrain" stroller, and while it is better off-road than the other Baby Jogger options we tested, we still wouldn't consider it a great choice for long-term off-road strolling. The GT scored an 8 of 10 in maneuverability, which is higher than the other Baby Jogger strollers we tested. The City Mini GT has suspension, but it isn't as good as the adjustable suspension on the BOB Revolution Flex. This stroller has a sportier feel than the other Baby Joggers and is easy to maneuver even in tight spaces. The wheels roll smoothly; you can push it with one hand most of the time. For pushing and turning off-road, this stroller is almost equally up to the challenge as it is on hard flat surfaces. The GT rolled over pretty much everything we threw at it without too much trouble. It is a little stiff to turn on grass, but it managed the better than some of the competition and parents will probably find they can make it over most terrains without cursing. The City Mini GT has an adjustable handlebar that rotates on a pivot point. This feature is useful for parents of different heights, but it puts taller users closer to the rear axle making it more likely they will kick the back of the stroller while moving. The wheels are where the GT diverge from the City Mini with foam filled rubber instead of foam-filled plastic. The form and function of the GT's wheels are far better than its sibling. The GT has an adjustable handlebar and is about average for comfort. This stroller has two wheel suspension, but it does offer more padding on a sling style seat than its smaller sibling. The rubber tires combined with the padding make for a more comfortable experience than the non-GT City Mini. The City Mini GT is neither large nor heavy, but there are smaller and lighter strollers in this review. This Baby Jogger weighs 21.6 lbs, which is below the average for the group, making it a good choice for a lighter stroller, but not as good as the Baby Jogger City Mini and Britax B-Agile 3 that each weighed 17.5 lbs. The GT is a nice size at 6,840 cubic inches. This makes it one of the smallest in the group and about 500 cubic inches smaller when folded than the previous version. The Baby Jogger GT is a little nicer than the average product in this review for quality. The GT earned a 6 of 10 for quality. There are no discernible differences between this stroller and the non-GT version of the City Mini, the Baby Jogger City Mini. The fabric on this stroller is slick, finely woven canvas material. It is smooth and wipes down easily, but probably isn't breathable. The material is continuous on the entire stroller and wraps around the frame, seat, and canopy in virtually one piece. The material on the footrest is durable, but not as nice as the easy to clean rubberized material found on some of the competition. The material used for the basket is comparable to the rest of the stroller. The only real difference is it is slightly thicker with mesh sides. The plastic components and bunched fabric impacted the quality score for the City Mini GT. The frame on the GT is simple and sturdy. It has a nice finish and is similar in design to the Baby Jogger City Mini* and the Britax B-Agile 3. The overall fit and finish of this stroller are not as sleek and appealing to the eye as some of the more expensive competition, but it looks nice. 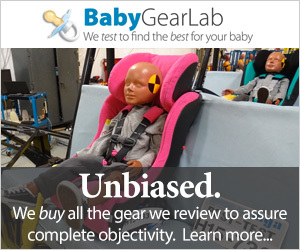 In our culmination of testing that included our backward tip over test as well as comparing the GT to other strollers, it had the most severe back tip issue in our tests. The problem is so significant that we do not recommend using the seat fully reclined. Amazon $251.99 - 30% off!